Background: 1,2,3-triazoles are an important class of organic compounds and because of their aromatic stability, they are not easily reduced, oxidized or hydrolyzed in acidic and basic environments. Moreover, 1,2,3-triazole derivatives are known by their important biological activities and have drawn considerable attention due to their variety of properties. The synthesis of this nucleus, based on the click chemistry concept, through the 1,3-dipolar addition reaction between azides and alkynes is a well-known procedure. This reaction has a wide range of applications, especially on the development of new drugs. Methods: The most prominent eco-friendly methods for the synthesis of triazoles under microwave irradiation published in articles from 2012-2018 were reviewed. 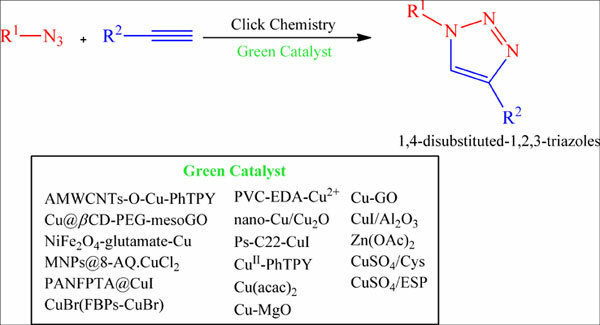 Results: In this review, we cover some of the recent eco-friendly CuAAC procedures for the click synthesis of 1,2,3-triazoles with remarks to new and easily recoverable catalysts, such as rhizobial cyclic β-1,2 glucan; WEB (water extract of banana); biosourced cyclosophoraose (CyS); egg shell powder (ESP); cyclodextrin (β- CD); fish bone powder; nanoparticle-based catalyst, among others. Conclusion: These eco-friendly procedures are a useful tool for the synthesis of 1,2,3-triazoles, providing many advantages on the synthesis of this class, such as shorter reaction times, easier work-up and higher yields when compared to classical procedures. Moreover, these methodologies can be applied to the industrial synthesis of drugs and to other areas. Click chemistry, 1, 2, 3-triazoles, drugs, eco-friendly procedures, aromaticially stable, industrial synthesis.